This award-winning BBC TV series uses Makaton sign language and is aimed at children with learning and communication difficulties – but it has also proved incredibly popular with many other pre-school viewers. These eight episodes focus on everyday aspects of young children’s lives, and feature clowning and tomfoolery from the irrepressible Mr Tumble (as well as Lord Tumble, Aunt Polly and Grandad Tumble). Mr Tumble and Fisherman Tumble..
Own Something Special - Its Party Time DVD from Deff, DVD, Blu-Ray & 4K Video Specialists - Free UK Delivery.. This award-winning BBC TV series uses Makaton sign language to help children with learning and communication difficulties, and is highly popular with younger viewers. These seven episodes see Mr Tumble and friends having fun in a variety of places with plenty of activities. Mr Tumble plays at being a king, Justin visits an ice cream factory, Justin’s friends happily show off their pets, Mr Tumble goes bird watching and Justin and his fr.. This award-winning BBC TV series uses Makaton sign language and is aimed at children with learning and communication difficulties - but it has also proved incredibly popular with many other pre-school viewers. These eight episodes focus on everyday aspects of young children's lives, and feature clowning and tomfoolery from the irrepressible Mr Tumble (as well as Lord Tumble, Aunt Polly and Grandad Tumble). Justin goes round to his frien..
Airport: Today Justin and his friends look for three special things at the airport. Meanwhile Mr Tumble is trying to find his own way to get up, up in the air, can Grandad Tumble help him? Garden Centre: Justin and his friends visit a garden centre today to look for three special things. Meanwhile Mr Tumble is looking in the garden for a hole for his beautiful plant. By The Sea: Justin and his friends are off to the seaside and so is Mr..
Something Special: Where are you now Mr Tumble? The award-winning BBC TV series Something Special has been carefully designed for children with learning and communication difficulties. Using Makaton signs and symbols as well as rhymes and songs - alongside Mr Tumble's unique and hilarious slapstick - it helps encourage communication and develop language in a fun and exciting way. In these eight new episodes Mr Tumble once again sends Ju.. Using Makaton signing, Justin and Mr Tumble help children learn how to communicate and develop language skills in a fun and exciting way. Includes 8 fun-filled episodes including the popular festive special – A Magical Christmas. It’s Christmas Eve and the Tumble family is desperately trying to get everything ready for Christmas Day. In true Tumble fashion, chaos ensues - will they ever get ready for Christmas? Justin goes to the th..
Own Something Special - Boxset DVD from Deff, DVD, Blu-Ray & 4K Video Specialists - Free UK Delivery..
Own Something Special - Days Out With Friends DVD from Deff, DVD, Blu-Ray & 4K Video Specialists - Free UK Delivery.. This award-winning BBC TV series uses Makaton sign language to help children with learning and communication difficulties, and is highly popular with younger viewers. 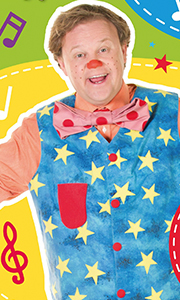 These seven episodes see Mr Tumble, along with Lord Tumble, Aunt Polly and Grandad Tumble, having fun in a variety of locations and ways, playing in both a snow dome and space centre, along with baking cakes and painting! Mr Tumble turns detective in Police, and in Donkey ..
Own Something Special - How Are You Mr Tumble DVD from Deff, DVD, Blu-Ray & 4K Video Specialists - Free UK Delivery..
Own Something Special - Laugh With Mr Tumbles DVD from Deff, DVD, Blu-Ray & 4K Video Specialists - Free UK Delivery.. This award-winning BBC TV series uses Makaton sign language and was carefully designed for children with learning difficulties - but it has also proved incredibly popular with many other pre-school viewers. Justin and his young friends set off on eight exciting new quests including some special Christmas fun, a birthday party as well as a visit to a cafe. And, of course, there's always time for everyones favourite....Mr Tumble - not to ..
Own Something Special - Mr Tumble Bumper Collection DVD from Deff, DVD, Blu-Ray & 4K Video Specialists - Free UK Delivery..
Own Something Special - Off On An Adventure DVD from Deff, DVD, Blu-Ray & 4K Video Specialists - Free UK Delivery.. This award-winning BBC TV series uses makaton sign language and is aimed at children with learning communication difficulties - and it has also proved incredibly popular with many other pre-school viewers. These eight episodes focus on sporty aspects of young children's lives, featuring clowning and tomfoolery from the irrepressible Mr Tumble (as well as Lord Tumble, Aunt Polly and Grandad Tumble). Justin visits a fun gymnastics club, M.. This award-winning BBC TV series uses Makaton sign language to help children with learning and communication difficulties, and is highly popular with younger viewers. These eight episodes see Mr Tumble and his friends having lots of fun and laughter in a variety of places with plenty of activities. Super Tumble rescues shopkeeper Tumble, Baker Tumble and Aunt Polly; Justin has lots of summer fun with his friends, and Mr Tumble judges ..
Own Something Special - Time For Mr Tumble DVD from Deff, DVD, Blu-Ray & 4K Video Specialists - Free UK Delivery..